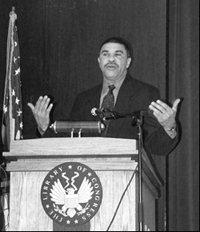 Rep. William Lacy Clay (D-MO) joined Kucinich in sponsoring the resolution to initiate impeachment proceedings. "At the urging of my constituents in Missouri's 1st Congressional District, and from Americans across the country, I cosponsored Congressman Kucinich's resolution regarding the impeachment of the Vice President because I believe that Mr. Cheney deliberately manipulated the intelligence process to deceive the Congress of the United States and the American people," Rep. Clay said in a statement sent to RAW STORY. He added, "That deception has resulted in a tragic, unnecessary war that has already cost the lives of over 3,300 brave Americans and has cost the taxpayers over $400 billion. The arrogant abuse of power and the complete disregard for the truth needs to stop." Rep. Jan Schakowsky (D-IL) also sponsored Kucinich's resolution. A spokesman for the Congressmember said she had not yet decided to release a statement on why she supported the measure. While Kucinich's articles of impeachment have finally picked up co-sponsors, they still face another major procedural hurdle. A spokesperson for the House Judiciary Committee told Atlanta Progressive News that the impeachment motion has yet to be put on the Committee's plate. "It's not at this time on the Committee's immediate agenda," Melanie Roussell, a spokesperson to Rep. John Conyers (D-MI), said to APN.